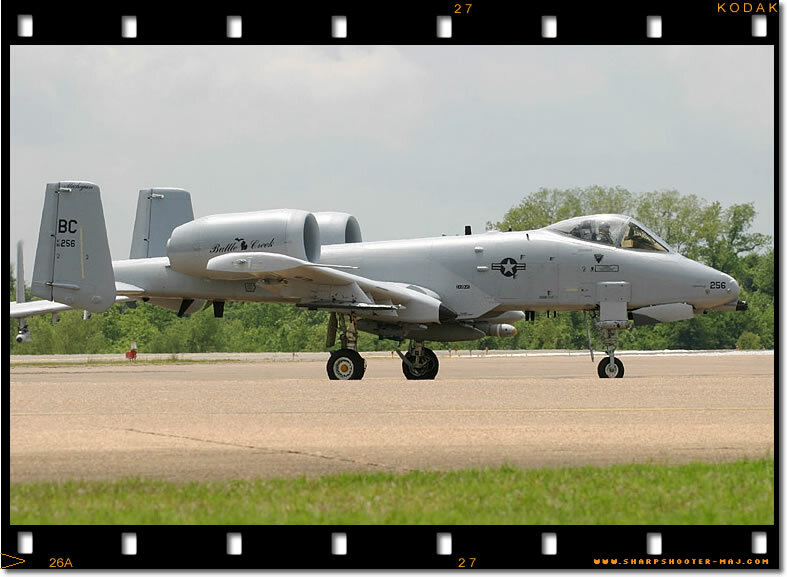 To foster closer cooperation between Warthog units and sharpen their Close Air Support (CAS) skills the third biennial ‘Hawgsmoke’ competition was hosted by the 47th FS ‘Dogpatchers’ in central Louisiana at the former England Air Force Base - now known as Alexandria International Airport – England Airpark - between April 29 and May 2 2004. 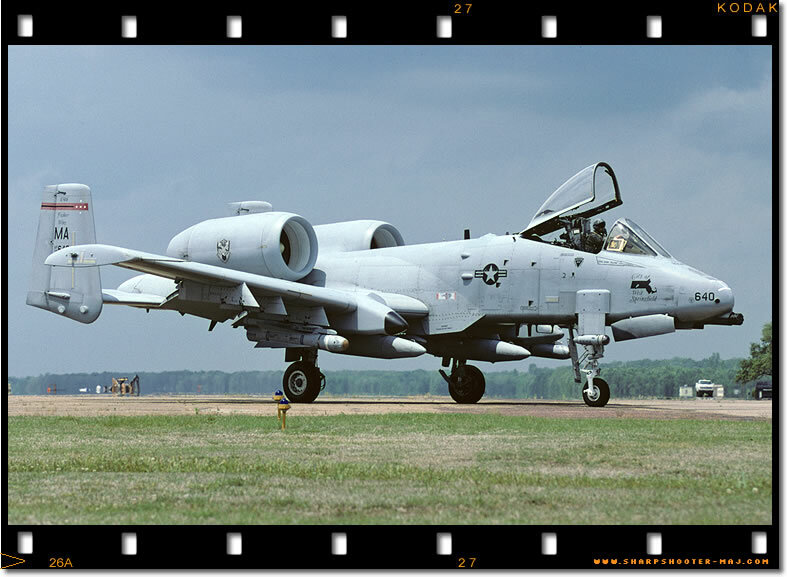 No less than eighteen four-man teams made the effort to attend, representing all but one of the A-10 units based worldwide. The only absentee was the 355th Fighter Squadron from Eielson AFB Alaska, who were forward deployed in support of real-world operations. LtCol. 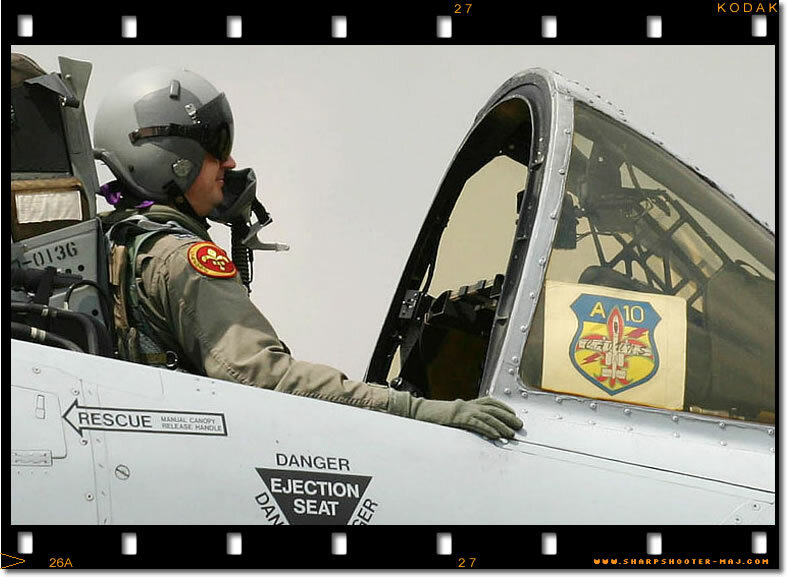 James ‘Jimbo’ Macaulay, 47th Fighter Squadron Director of Operations, and the Hawgsmoke 2004 project officer summed up his aims for the competition: “ Hawgsmoke is an intense flying competition and a opportunity to share in the camaraderie and legacy of the world's premier Close Air Support fighter." This was to be a grand southern flavoured ‘Hawg Festival’. 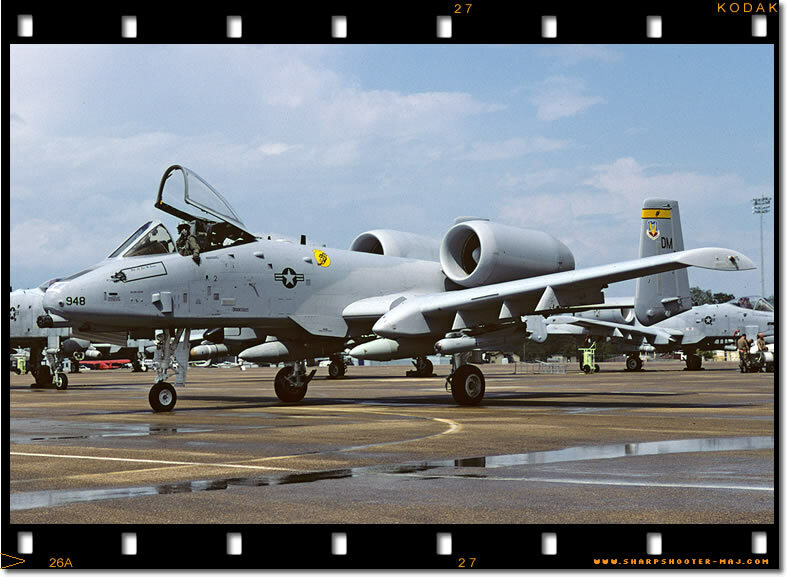 The original idea, by Hawgsmoke ‘Big Toe’ Col. Cliff Latta from the Michigan Air National Guards 172nd Fighter Squadron, was to inaugurate a biennial worldwide A-10 bombing /tactical gunnery competition as a replacement for the discontinued ‘Gunsmoke’ competition . 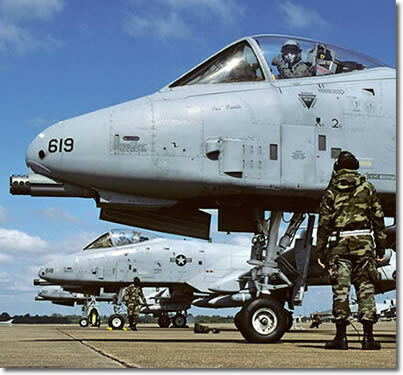 Four-ship teams of airplanes and pilots from A-10 units around the globe would fly and compete for the honour of being the ‘Best of the Best’ in ground attack and target destruction. 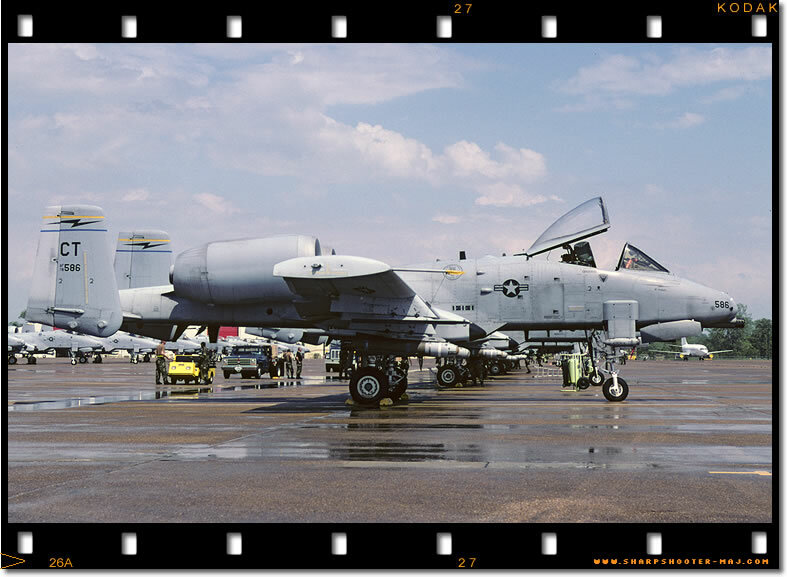 (Gunsmoke was the worldwide air-to-ground gunnery/bombing competition held at Nellis AFB that ended in 1995 primarily because it was cost-prohibitive for the participating units to fly their teams and ground crew out to Nevada, although it is set to return in 2005). 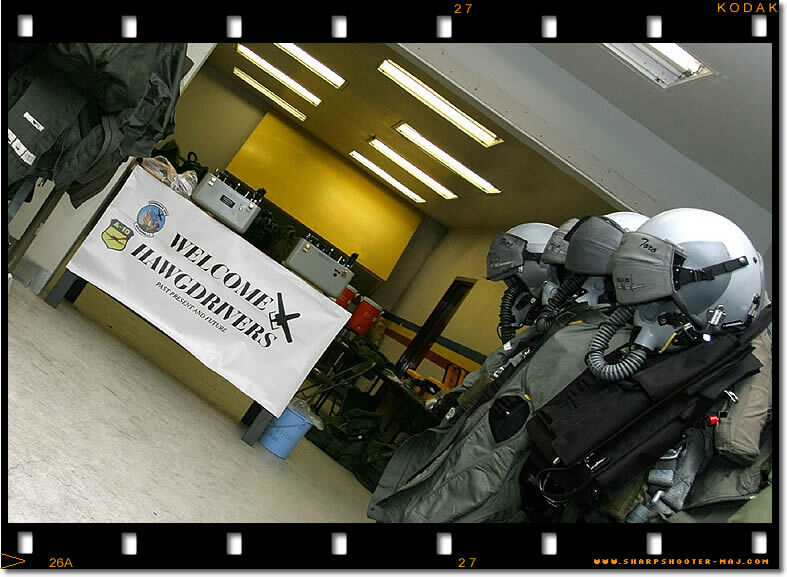 The 172nd FS, from Battle Creek, hosted the inaugural Hawgsmoke 2000 at the remote Alpena Combat Readiness Training Center in northernmost Michigan. 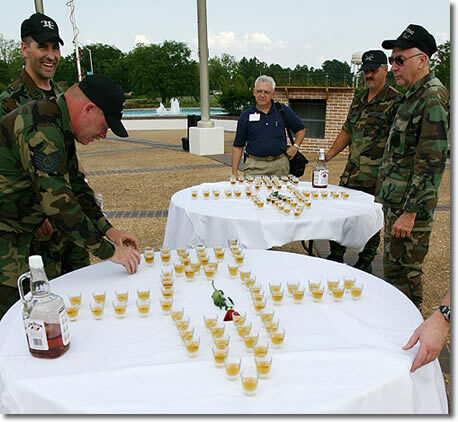 ‘Top Team’ honours went to the Connecticut ANG who subsequently hosted Hawgsmoke 2002 at the Fort Drum Forward Operating Location in New York State. Led by LtCol. 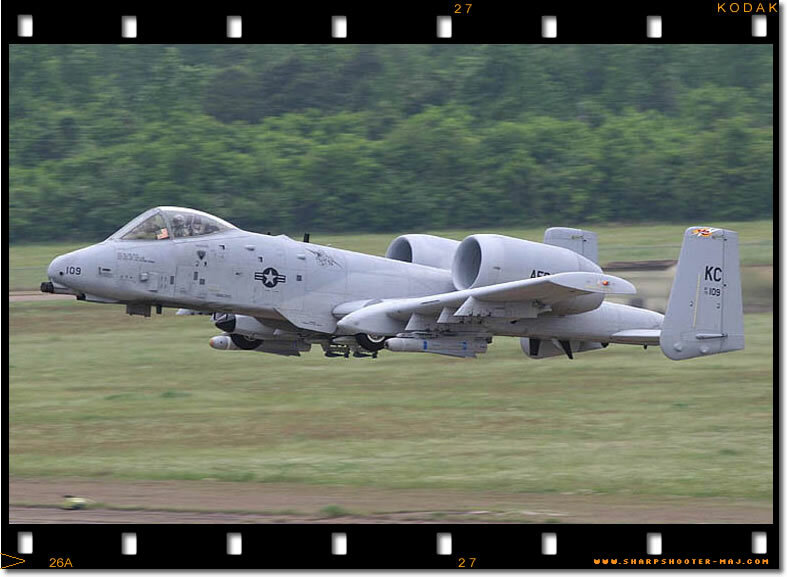 Macaulay, the Air Force Reserve Commands (AFRC) 47th Fighter Squadron team took the Al ‘Mud’ Moore trophy for ‘Top Overall A-10 Team’ at Hawgsmoke 2002, thereby earning the honour of hosting the 2004 event. 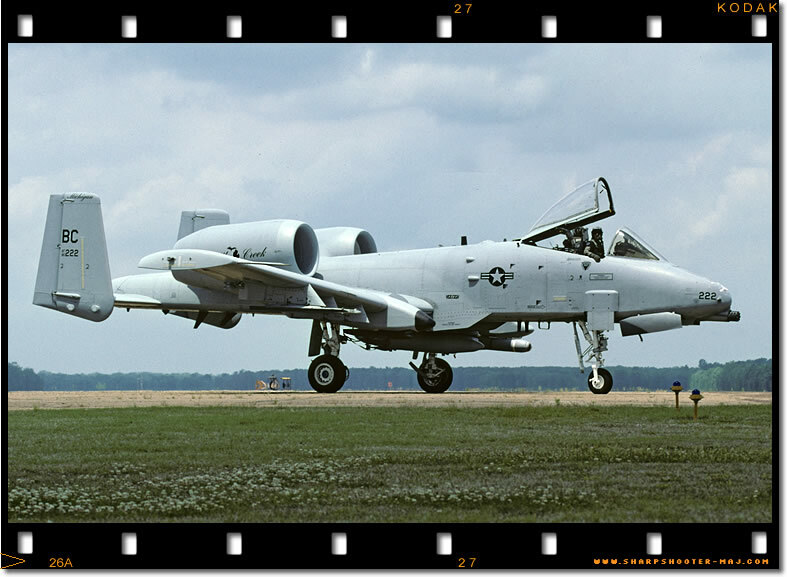 The main Hawgsmoke 2004 flying competition would take place on the nearby Claiborne Aerial Gunnery Range tactically employing the A-10. 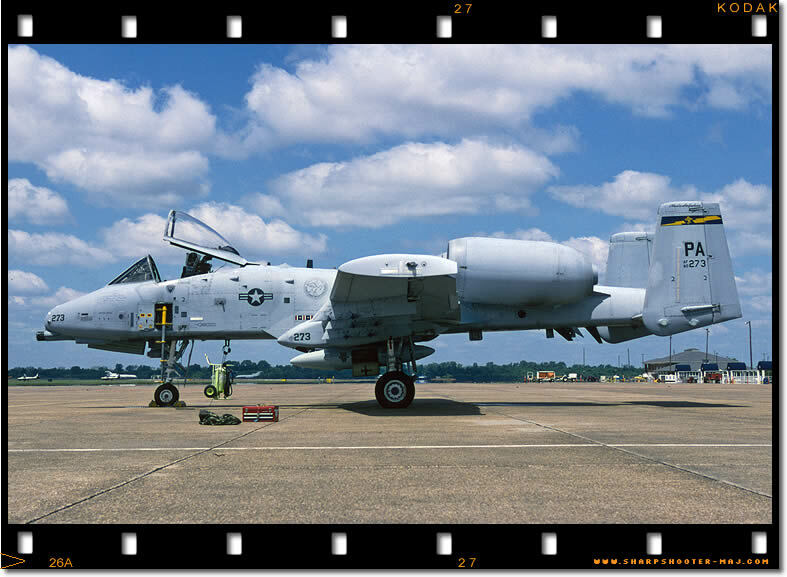 Designed by Maj Brady “Bozz” Glick and Maj “Thor” Olson, both veterans of the two previous Hawgsmoke competitions, the flying competition placed a premium on skill and efficiency in target destruction, while testing basic tenants of airmanship and flight leadership. LtCol. Macaulay explained the various aspects of the Hawgmoke flying competition: “The first is a CAS mission simulating CBU-87 - our combined effects munitions - against an enemy tank. Nobody knows but me where it is going to be until they get airborne and open the envelope. They will have to locate it and figure out the attack axis that will be applicable to kill that tank, with each guy making one pass simulating a CBU-87 drop. 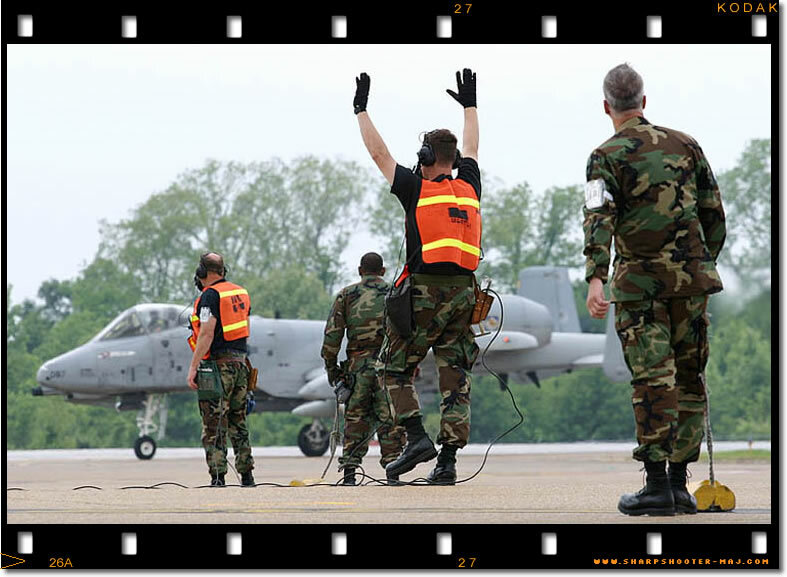 The second tactical problem is the conventional range portion, this is what we call ‘sport bombing’, where the teams are going to drop six BDU-33 practice bombs and strafe a hundred rounds with the GAU-8. We measure the bomb scores down to three metres. The strafe runs are scored acoustically - a microphone placed underneath the target measures the shockwave of the bullets passing over it in a very finite cone. The third part is the Maverick event where we have a moving convoy of four vehicles - we call it ‘Osama’s convoy’. We are going to use simulated AGM-65 missiles to take out each one of those individual vehicles with each one of the flight members. 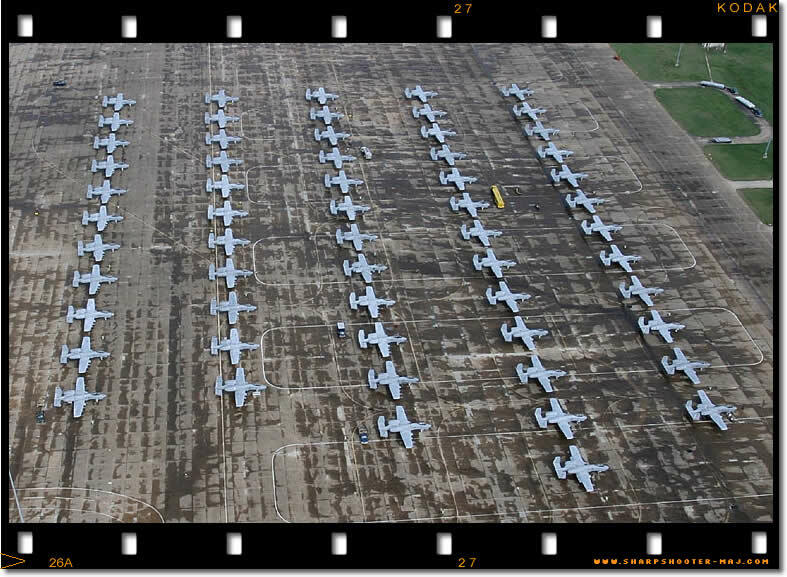 A-10As of the 23rd FG line up at the old England AFB once again. 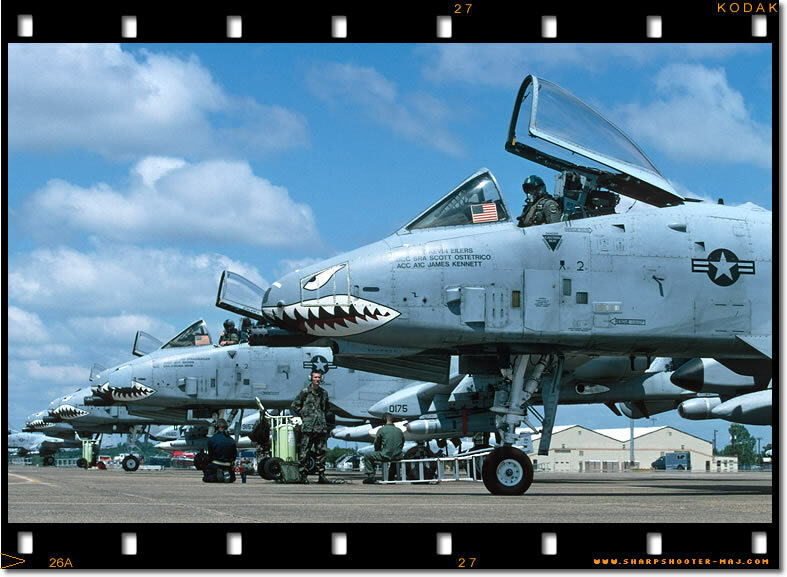 The ‘Flying Tigers’ A-10s flew from here for 12 years until 1992. 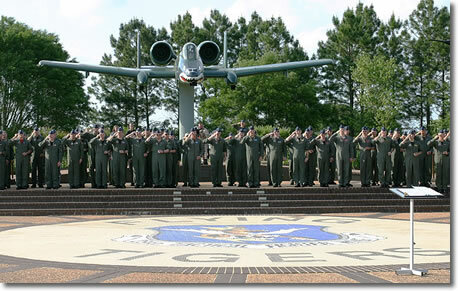 The 23rd FG are now based at Pope AFB and report to the 4th Wing at Seymour Johnson AFB, NC. 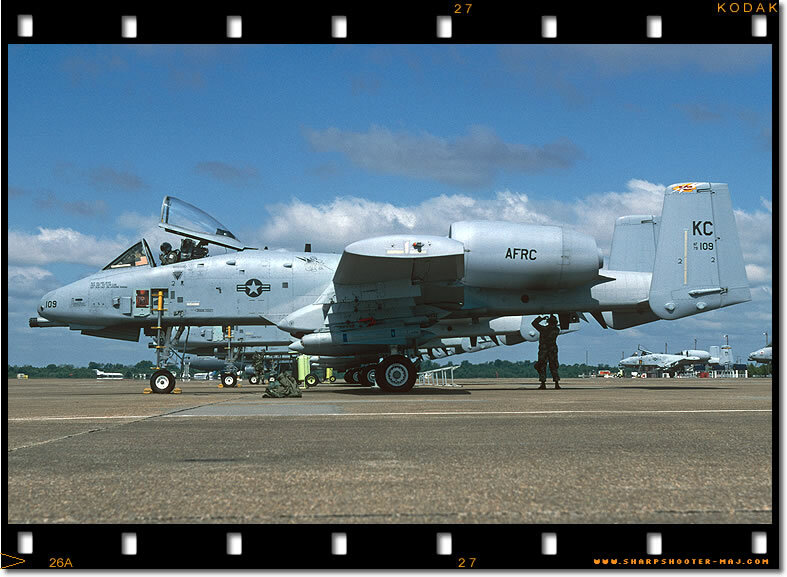 With a hint of what was to come in the sky, an A-10A from the 706th FS taxi's to the ramp at Alexandria. 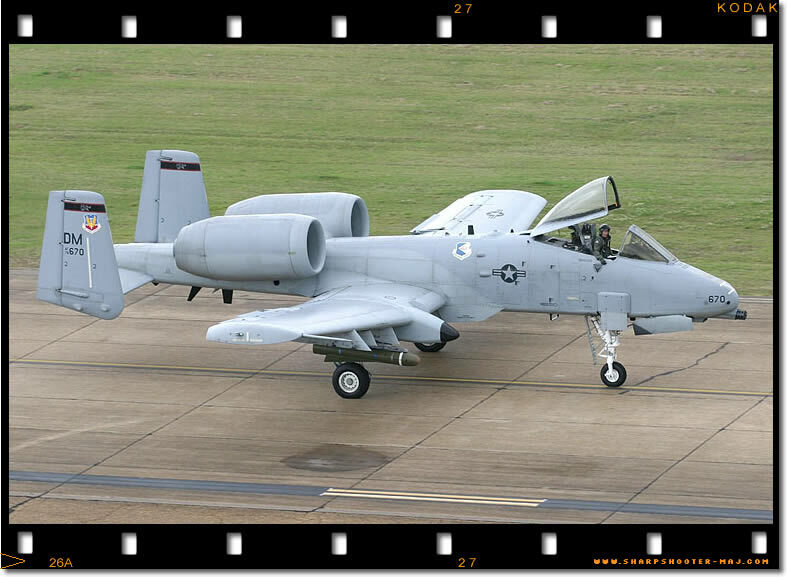 Still regarded as the ultimate Close Air Support platform, the Warthog is set to remain in service for another twenty years. 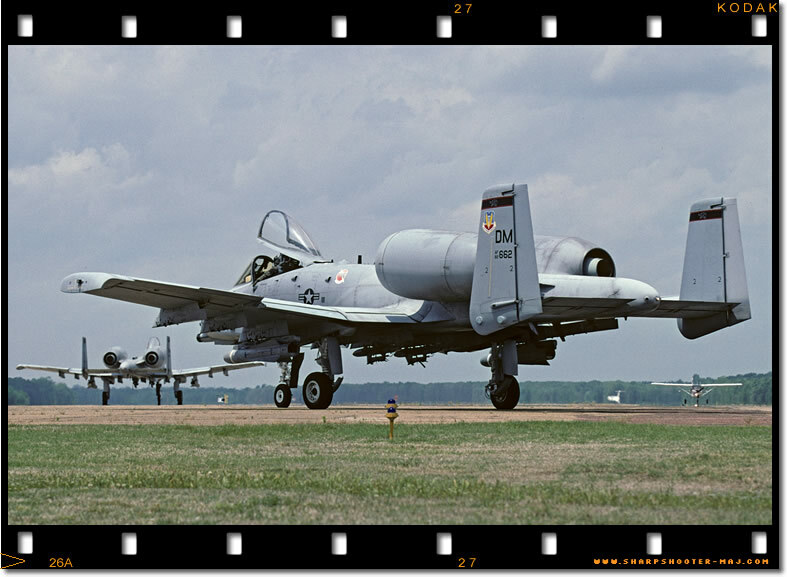 Tied with the host 47th FS for bringing the most A-10s to Hawgsmoke were the Michigan Guards 172nd FS, with ten 'Hogs'. 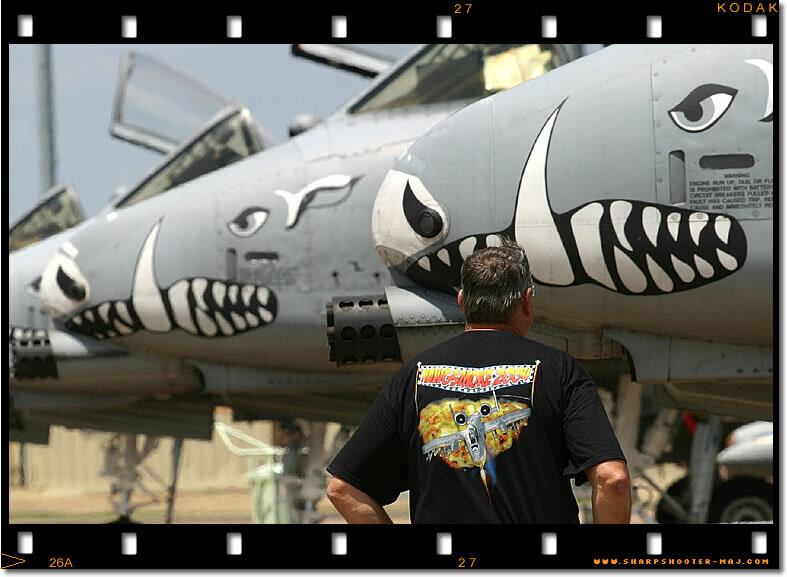 All the 47th FS A-10As carry nose art, characters from the Al Capp 'Dogpatch' cartoon series. 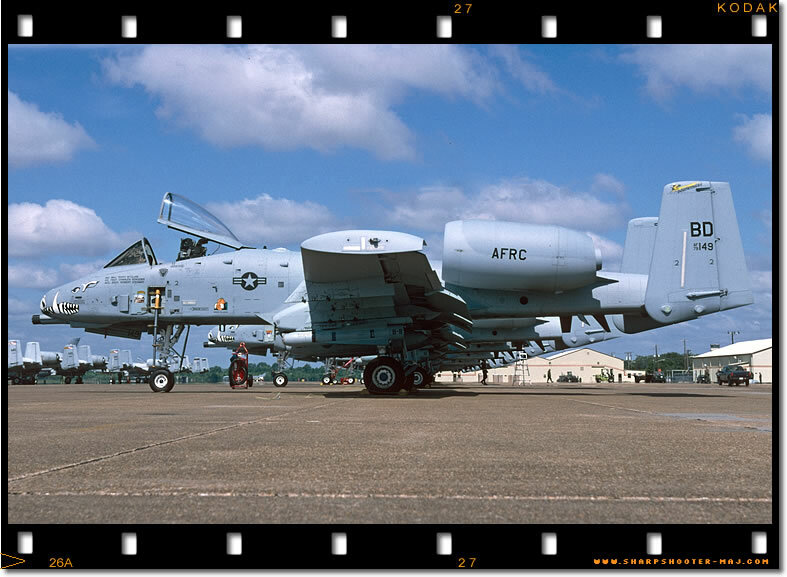 ‘Hogs Breath’ The 47 th FS brought most of their A-10s to Alexandria. Providing aircraft for teams from Nellis AFB and Spangdahlem, Germany who could not bring their own jets. 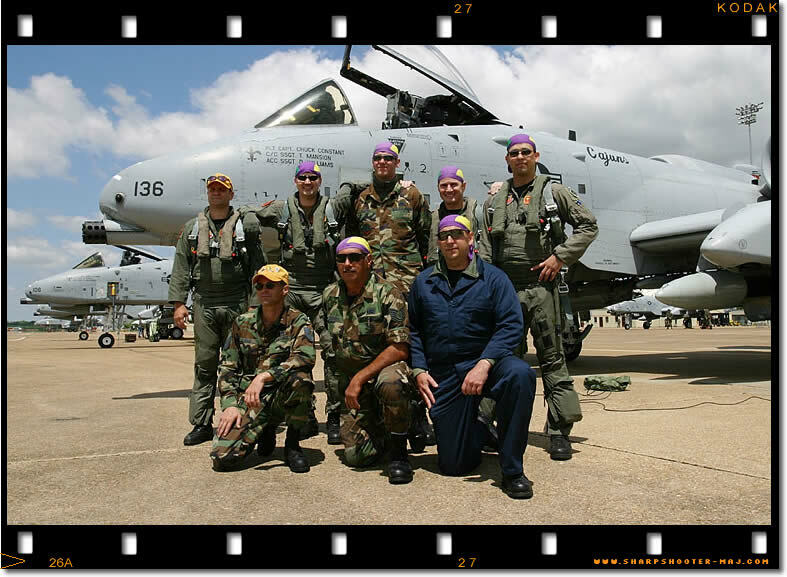 The Cajuns brought a team of Crew Chiefs up to Alexandria to assist with the mammoth task of turning over seventy A-10s, here they pose for a group shot with the 706th FS Hawgsmoke pilots. 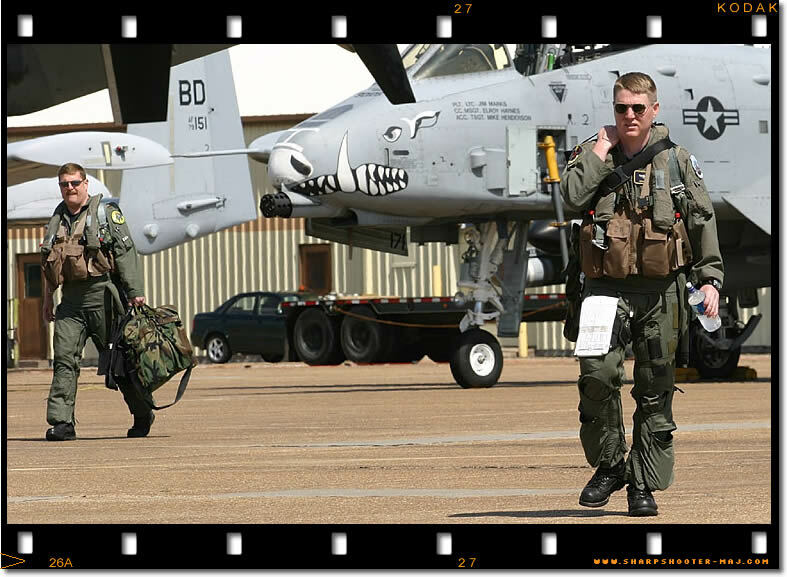 Warthog pilots set off for home at the conclusion of Hawgsmoke 2004 but vow to return in 2006 to finish the competition. 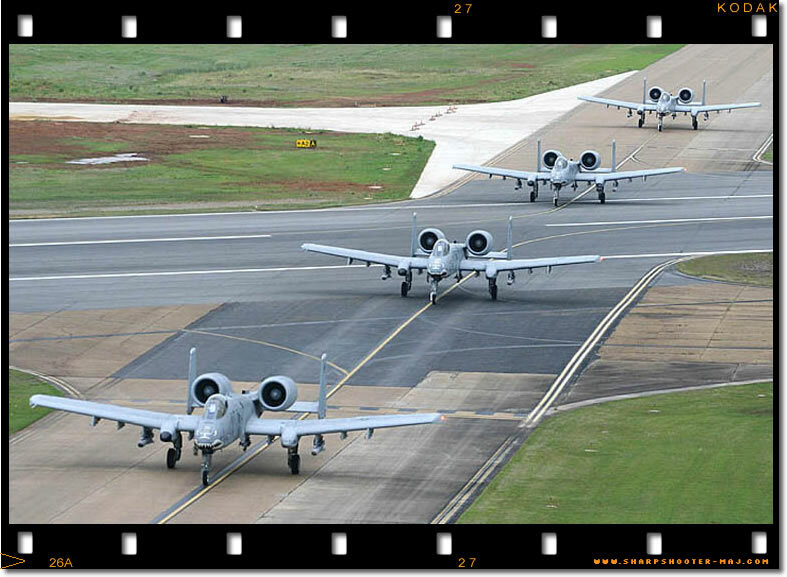 355th FW A-10s from Davis Monthan AFB, Arizona taxi to the active runway for their Hawgsmoke Range slot. Over 180 maintenance and support personnel from the 717th AMS recovered, fixed and launched 76 A-10s over the four-day competition. 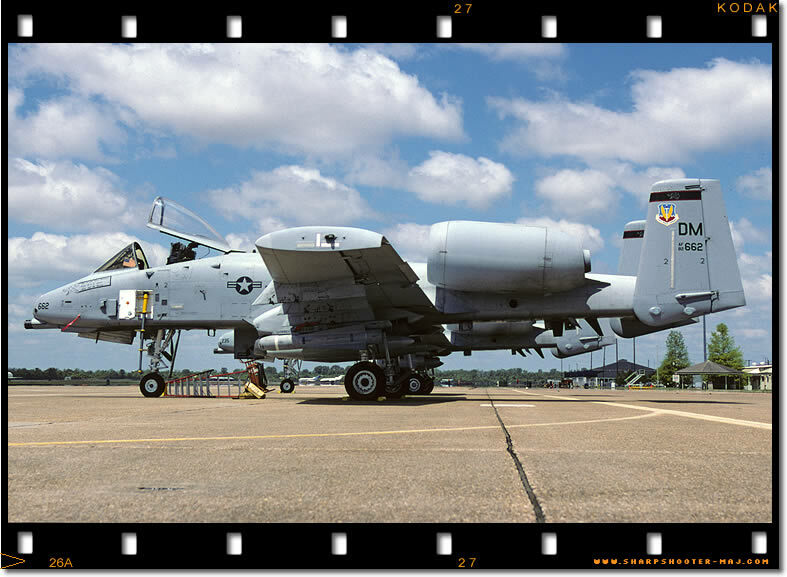 The Cajuns are unusual in the A-10 community as this is there second go at operating the 'Hog'. 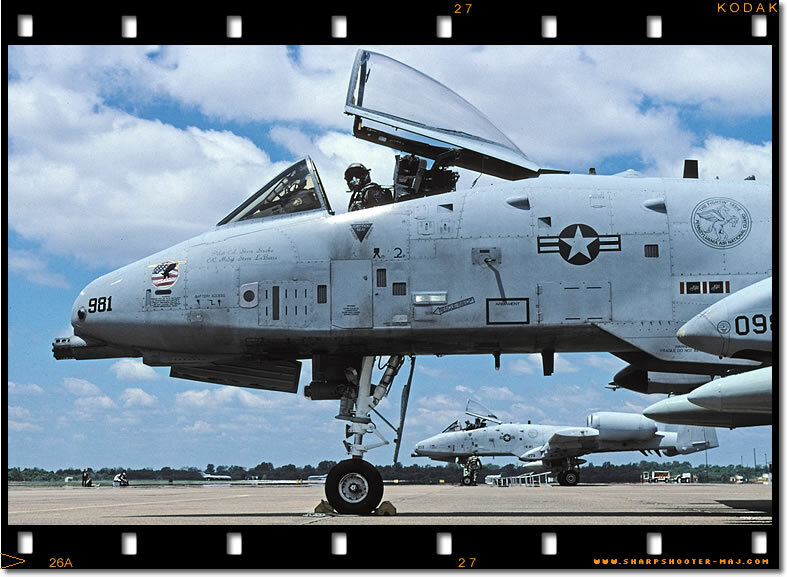 They first got A-10s in 1981, swapped to F-16s in 1992 but re-equiped with A-10s again in 1996. © Kevin Jackson The 190th FS from Boise Idaho went from SEAD to CAS in 1996 when they retired there F-4G's, they received there first A-10A on March 20 1996. 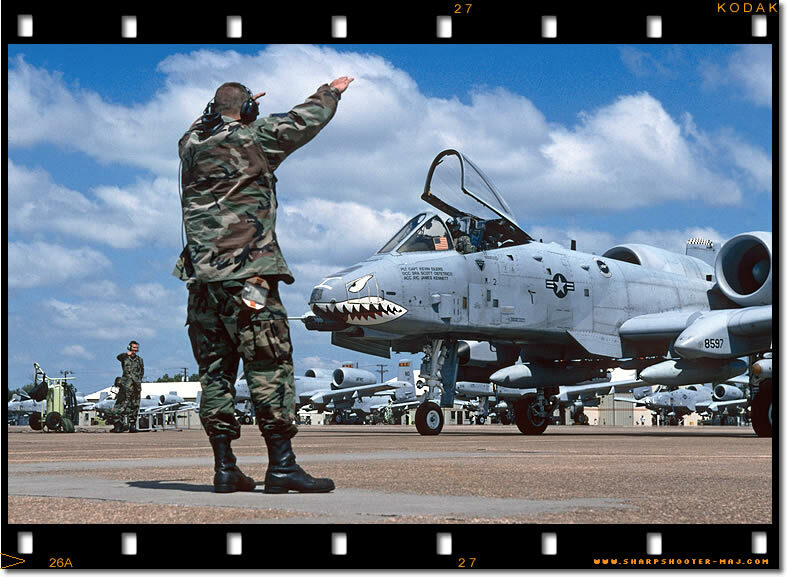 © Peter Greengrass The imposing sight of the A-10 as another squadron arrives for Hawgsmoke 2004. 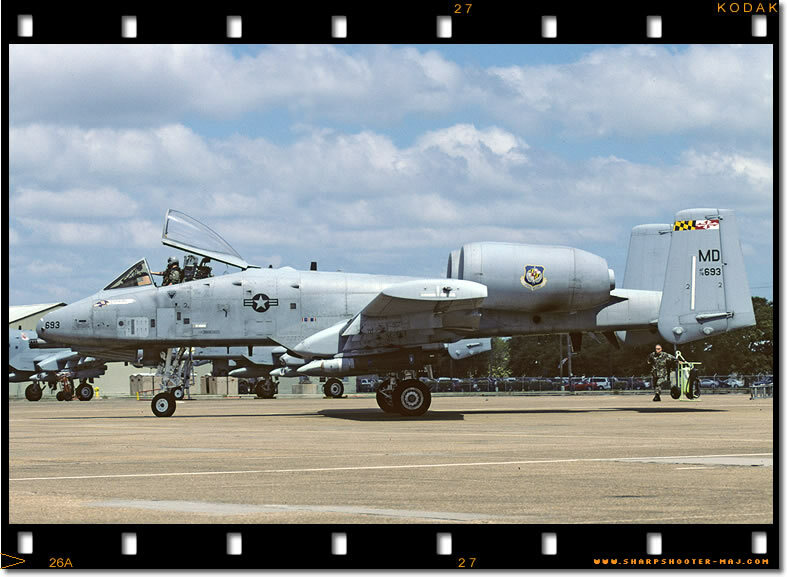 The oldest A-10A present at Hawgsmoke was 78-0586 assigned to the 118th FS, 103rd FW, Connecticutt ANG. 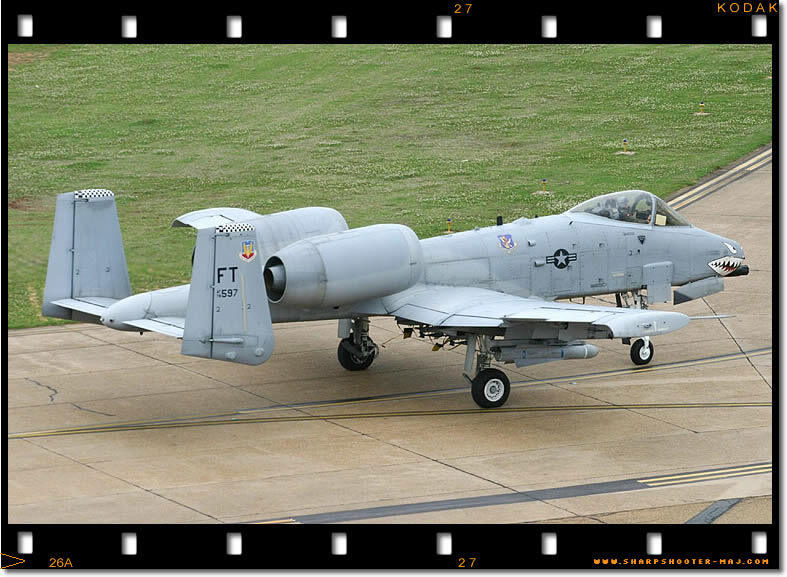 © Peter Greengrass 358th FS A-10A 78-0670 captured 'on digital' from the Alexandria tower. The 358th were one of the few teams that managed some range time. © Kevin Jackson The Pennsylvania ANG provided a four-jet team for the competition; here is 81-0981 lifting of the England Airpark runway en route to the range. 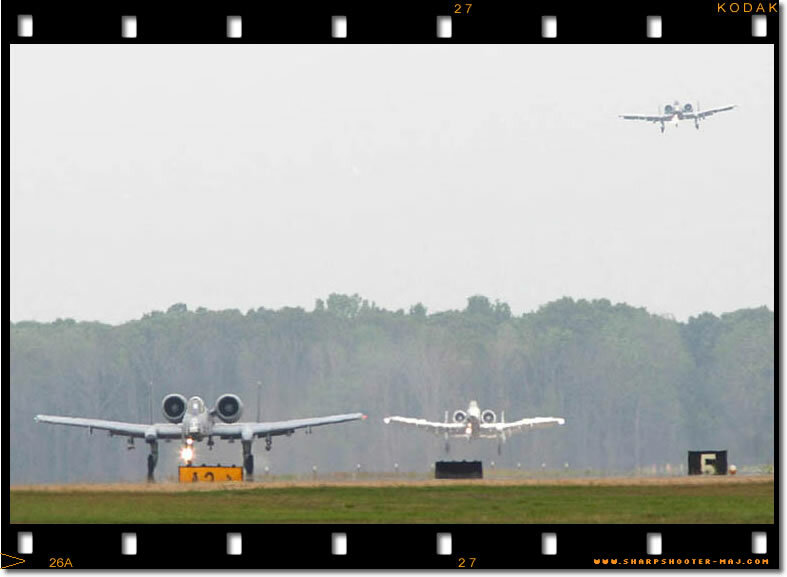 The EOR team work under the Michigan A-10s upon arrival in Alex. 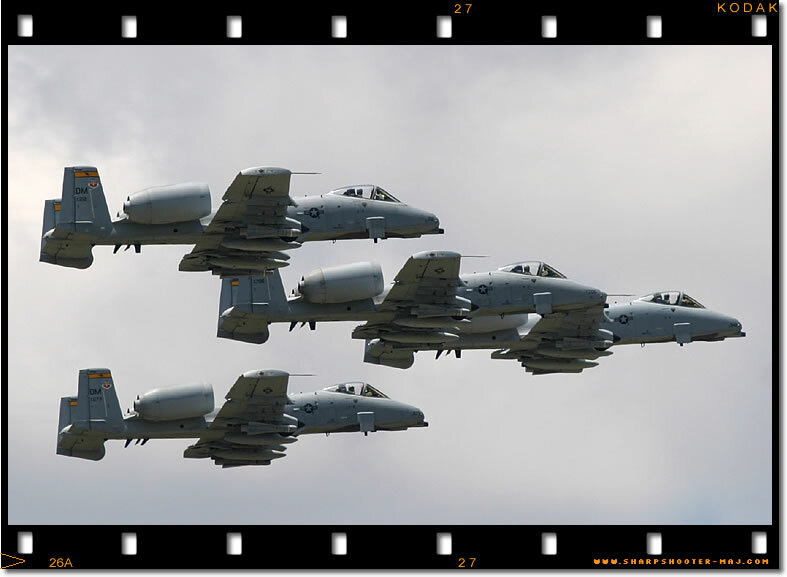 Thursday April 29th saw a constant stream of A-10s arriving at timed intervals. 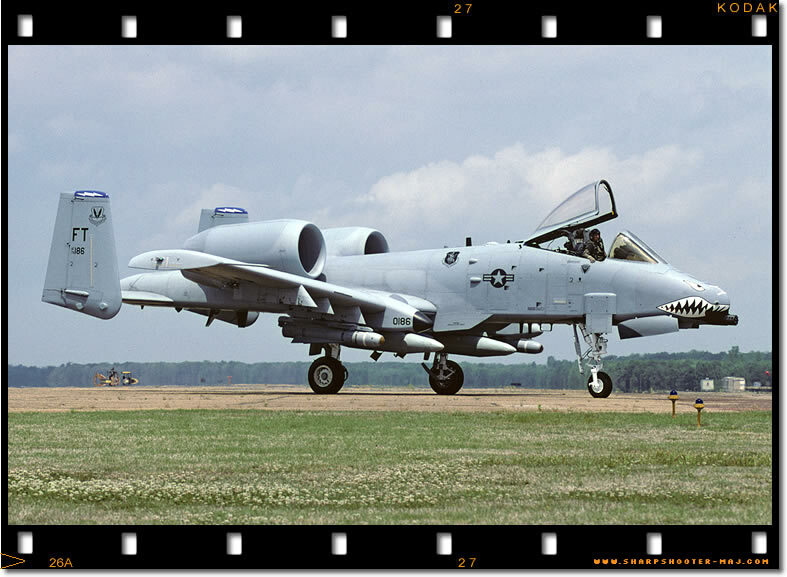 Some of the smartest A-10s to arrive came from the 'Cereal Killers' of Battle Creek, Michigan. 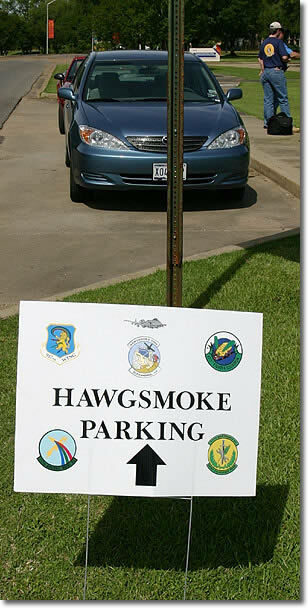 The 172nd FS inaugurated the Hawgsmoke competition in 2000. © Kevin Jackson Theres a Louisiana saying that goes 'If you don't like the weather, wait five minutes' A 357th FS Jet taxi's between th puddles on the packed Alexandria ramp. © Peter Greengrass A formation departure from the 357FS as they set off for Arizona at the conclusion of Hawgsmoke. © Kevin Jackson Even though the weather wasn't perfect on Thursday it got worst (see right!). The Maryland's Guard team line up at the EOR to be de-armed after arriving. © Kevin Jackson Competition day! 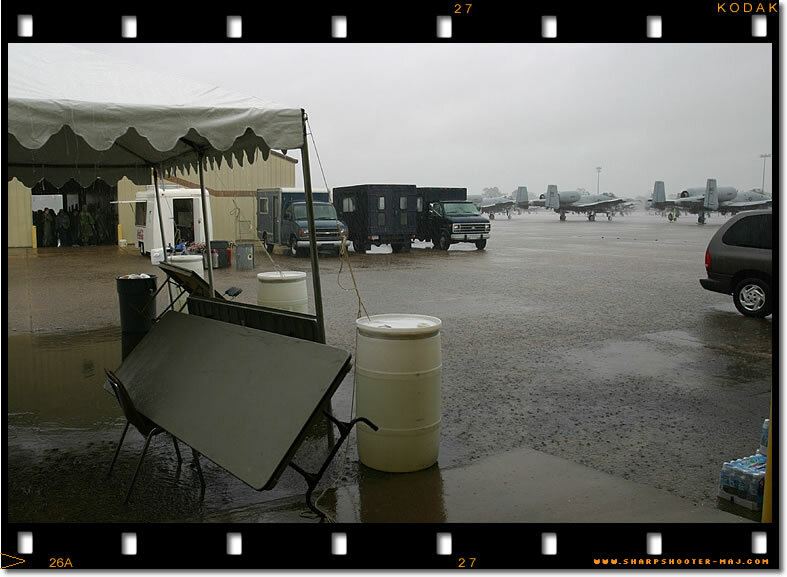 At the rather subdued closing speech and dinner it was generally felt that ‘Hawgwash’ 2004, as it had now been dubbed, was a success despite the weather: “This was due to the people we have flying, fixing and supporting the A-10. Not forgetting the support of England Airpark and the Alexandria community who made a huge impact on the success of the gathering.” according to LtCol. Macaulay, who also praised the supreme efforts made by the 180 support personnel of the 717th AMS (Aircraft Maintenance Squadron) led by CMSgt Bob Murray. The Hog community reunion was a huge success, as was the fantastic support by the local sponsors and England Airpark manager Scott Gammel’. 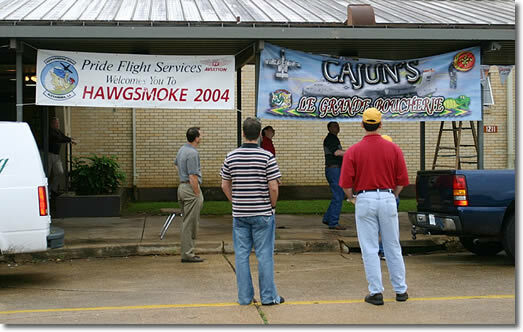 The perfect template is in place for Hawgsmoke 2006, although with no outright winning team the location and host are yet to be decided. At such a large gathering of Hog pilots it was appropriate that there should be a remembrance ceremony for fallen comrades. 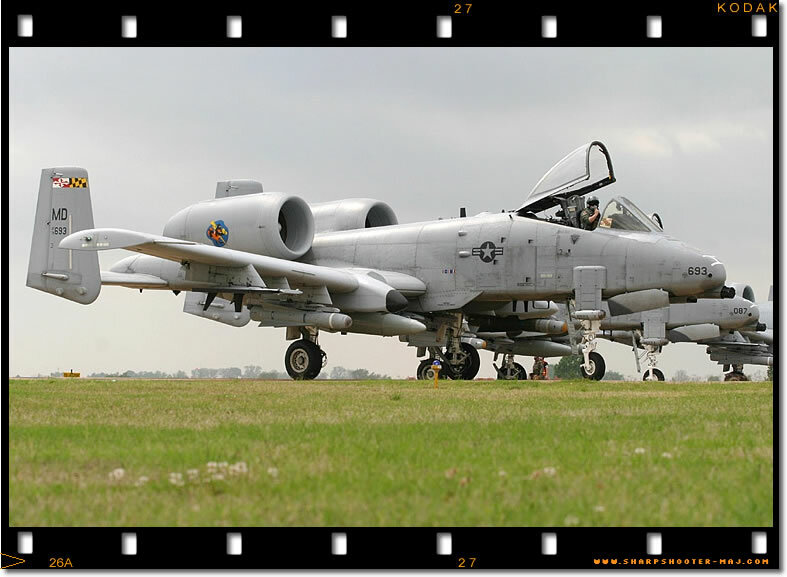 This took place at the England Heritage Memorial, appropriately under the preserved A-10 on Thursday evening. A short sermon by the 47th's Chaplin was followed by the reading of the names of all the fallen Hog drivers. 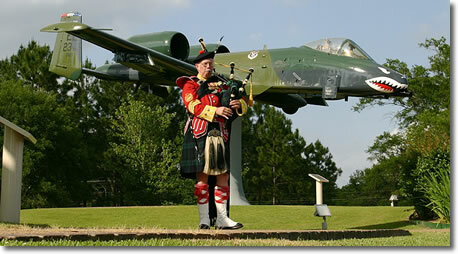 As a bagpiper played there followed an A-10 missing-man flypast and the customary downing of a shot of Whiskey to honour old friends and colleagues. Finally the shot glasses were smashed into a replica fireplace as a mark of respect for their colleagues who made the ultimate sacrifice, may they never be forgotten. Arriving on-time and in tight formation contributed to team scores for Hawgsmoke 2004. 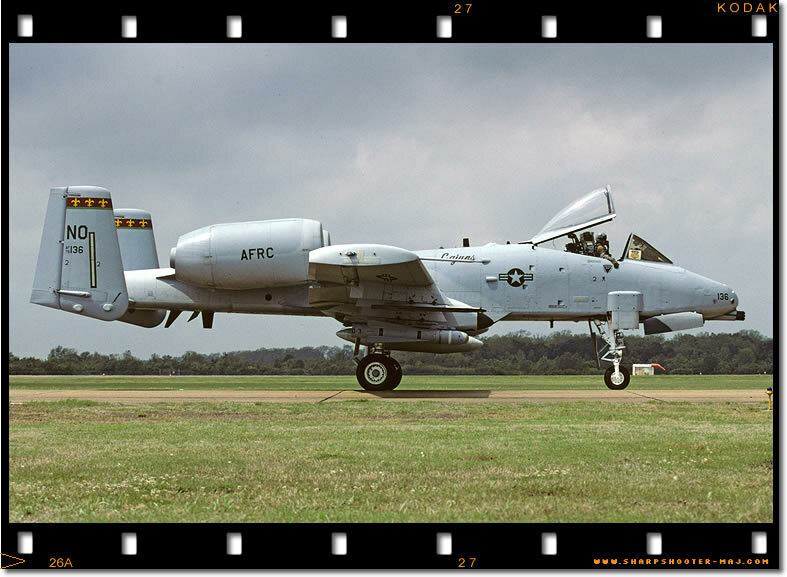 No stranger to Alexandria, this A-10A was last here - then England AFB - in 1992. 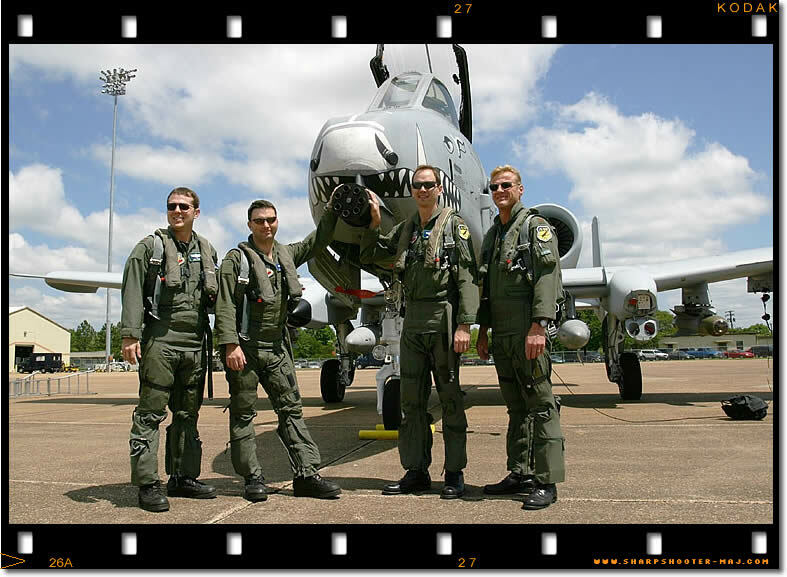 The hosts for Hawgsmoke 2004, the 47th FS is an A-10 FTU (Formal Training Unit) with a large proportion of full-time instructor pilots assigned. The temporary Hawgsmoke Life Support facilities complete with welcome sign. 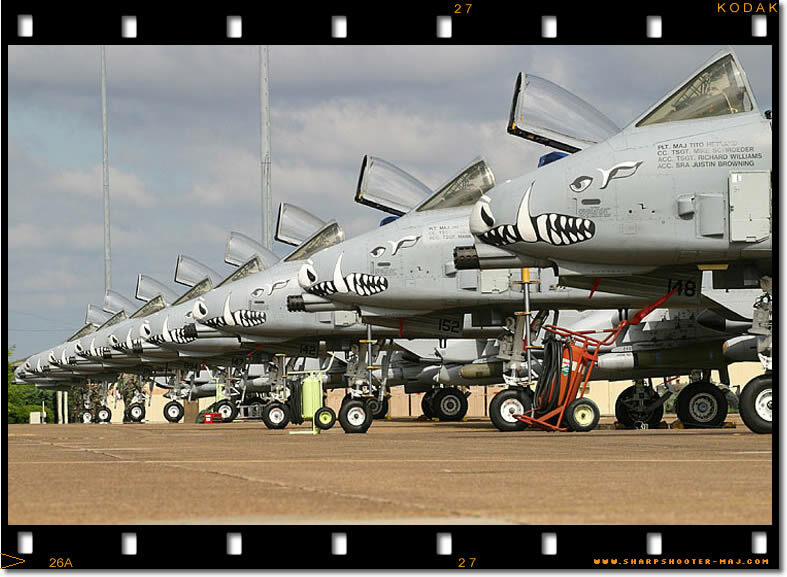 The distinctive Hog-teeth are worn on the A-10s belonging to the Hawgsmoke 2004 host unit, the 47th FS, nicknamed the ‘Dogpatchers’. 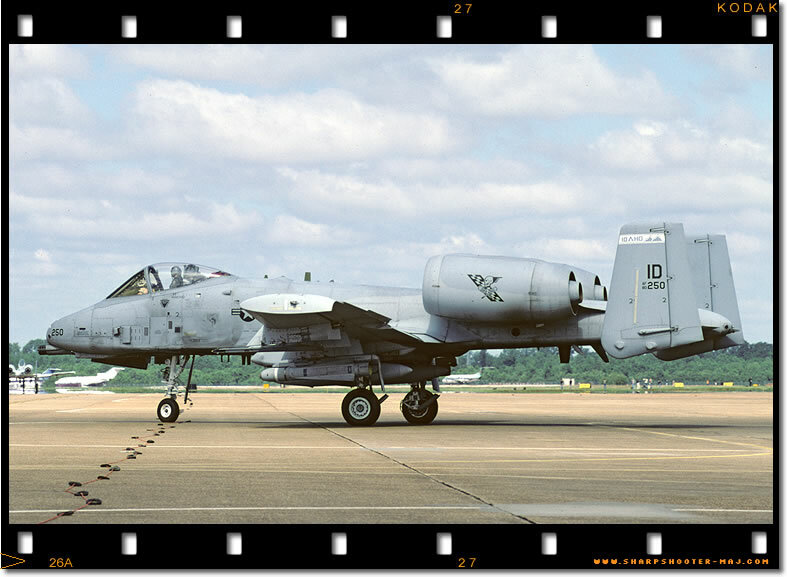 Preparing to depart on the Sunday is A-10A 78-0624 one of four 'Hogs' that made the trip from Boise, Idaho. 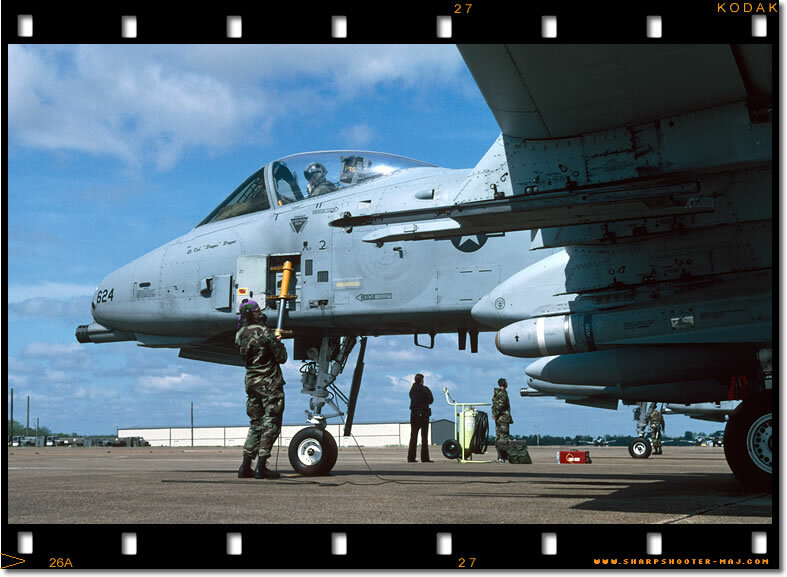 303rd FS/AFRC A-10A 79-0109 named 'Thunderbolt of Sedalia' gets a final check from it's crew chief before heading home to Whiteman AFB. 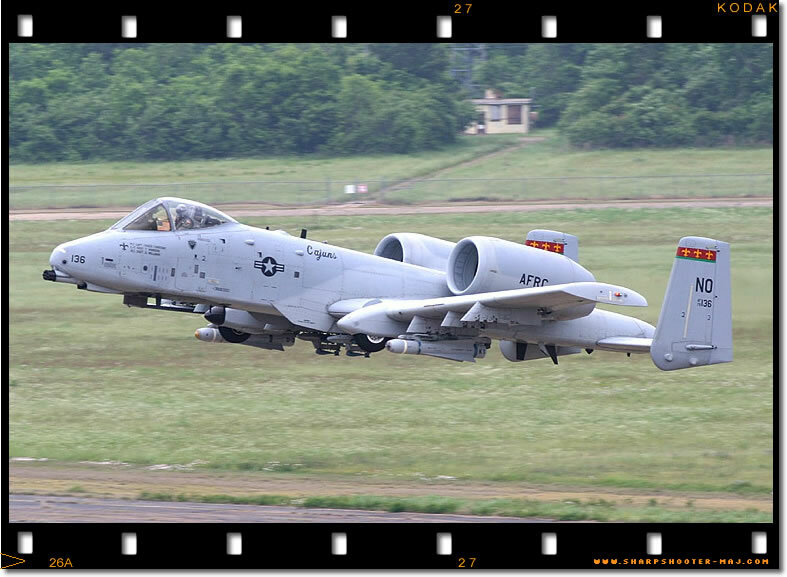 The 303rd FS from Whiteman AFB Missouri is one of three Air Force Reserve Command (AFRC) units flying the A-10A. 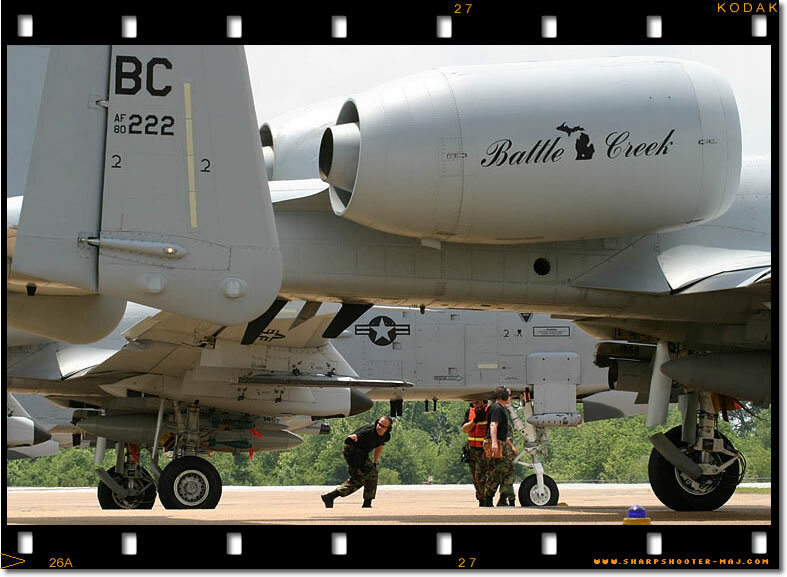 The 706th FS ‘Cajuns’ were one of only five teams to get time over the targets on the Claiborne Gunnery Range before bad weather curtailed flying for the remainder of Hawgsmoke 2004. Soaking up some sun instead of soaking wet, the Massachusetts Guard get ready to depart for home. 81-0981 from the 103rd FS, Pennsylvania ANG. A Hog driver from the Maryland ANG sitting in his ‘office’. 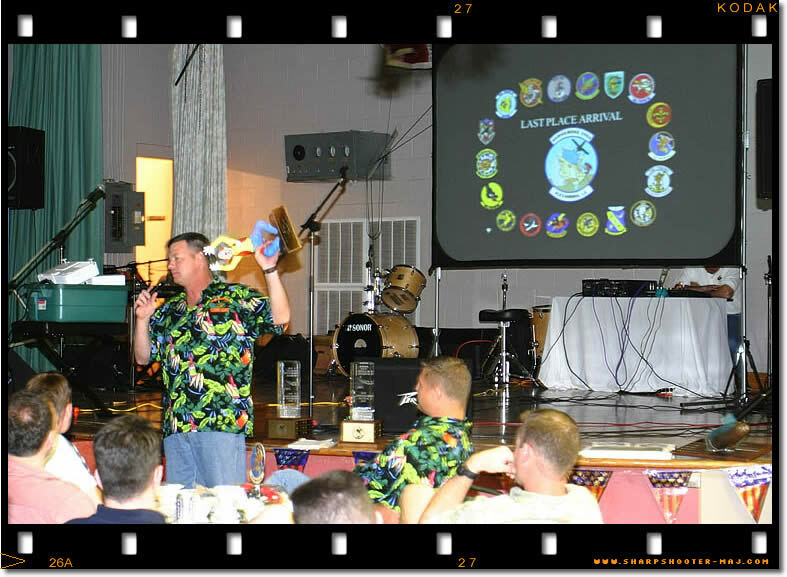 LTC Macaulay announces who came last in the arrival competition, one of the few prizes given out due to the curtailment of Hawgsmoke 2004. To spare their blushes I will not divulge the recipients! 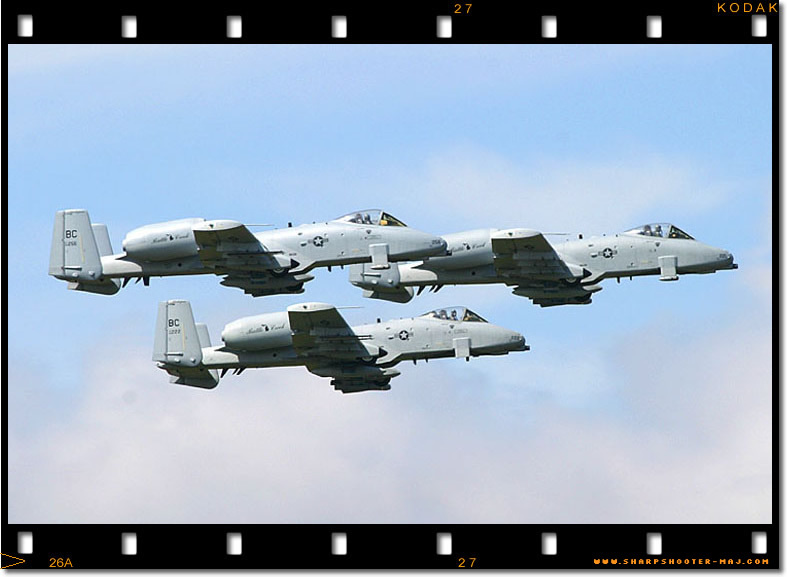 The 104th FS were the first ANG unit to recieve LASTE (Low Altitude Safety & Targeting Enhancement) modified A-10s. This program also finally gave the 'Hog' an autopilot. The 104th FS Maryland ANG team arrive at Alexandria from Baltimore. 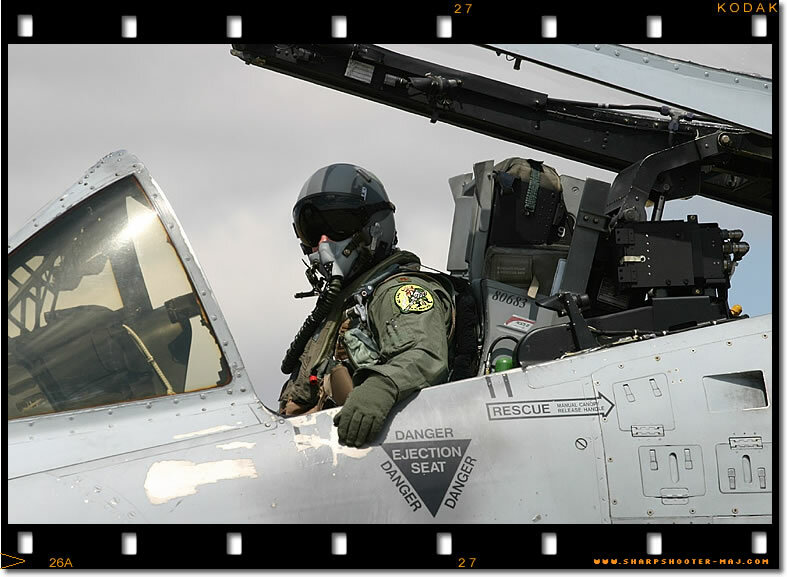 Hawgsmoke only requires pilots and jets to turn up, all ground handling is carried out by the host unit, the 47th FS. 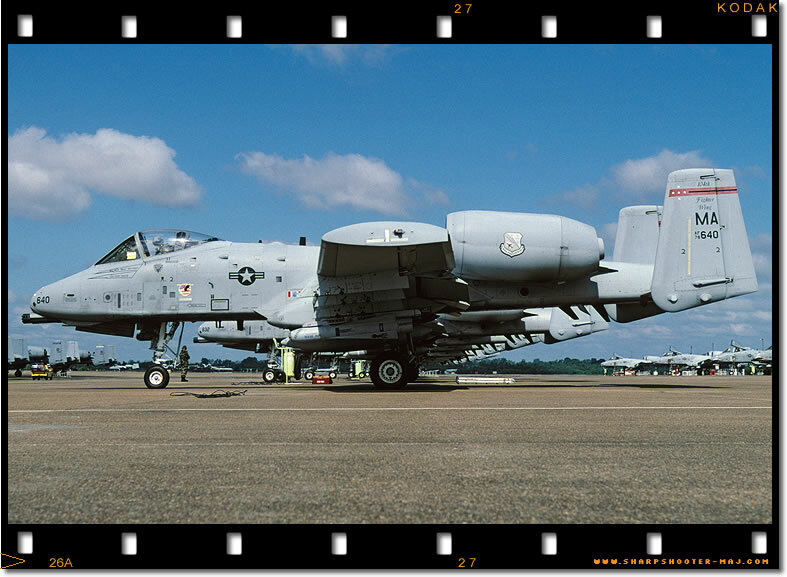 Sharpshooter would like to thank Jessica D’Aurizio of the 917th Wing and the entire AFRC Hawgsmoke Public Affairs team for their tireless media assistance. 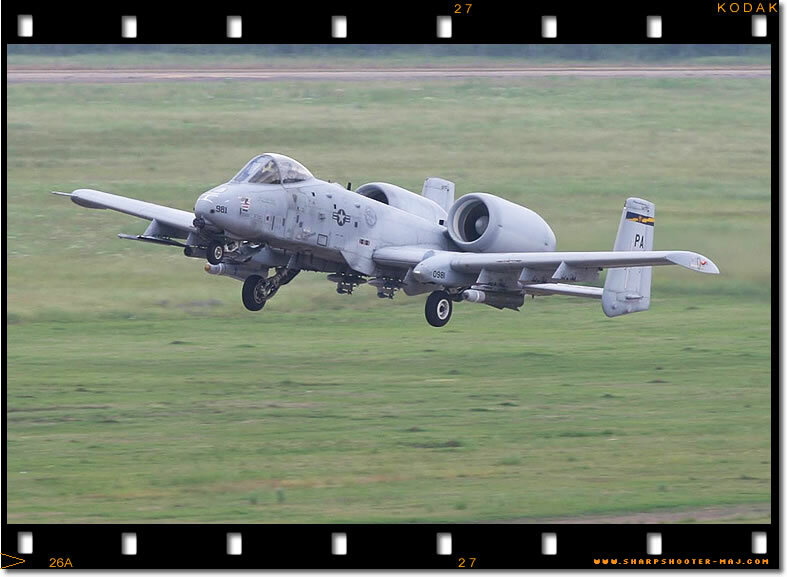 Also Lt Col. Macaulay and Maj. Travis and everyone from the 47th Fighter Squadron, and Joe Hodges from the A-10 SPO at Hill AFB for their outstanding help in the preparation of this article. 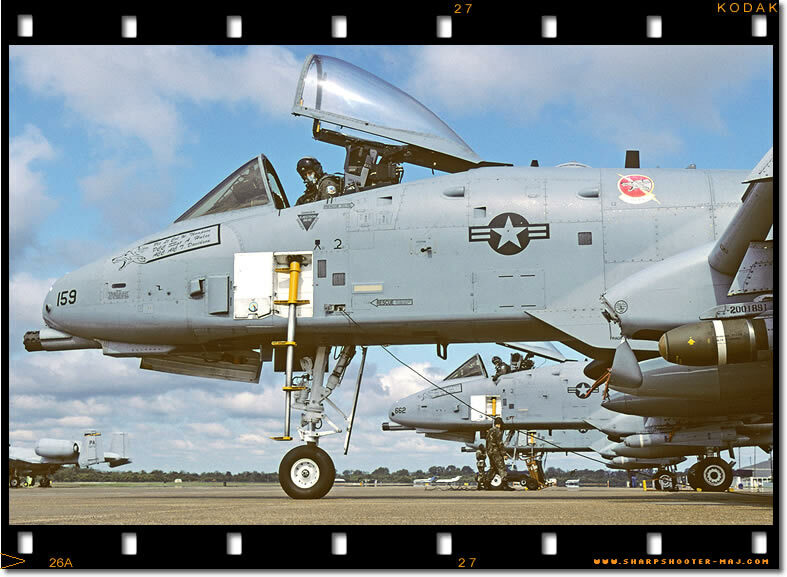 At England Airpark Scott Gammel and CMSgt Bob Murrey deserve praise for giving the media all the access requested for photography throughout the airfield.